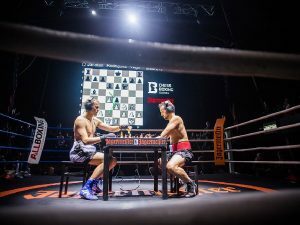 Here’s how chessboxing works: The fighters go eleven three-minute rounds, alternating between chess and boxing. The six rounds of chess allow for an eighteen minute game — so each fighter starts with nine minutes on his chess clock. A fighter wins by checkmate, knockout, opponent’s chess clock time running out, or technical knockout. After a boxing round, the fighters get a minute to gather their thoughts for the coming chess round. This is a very tough part of chessboxing — being able to calm down after three minutes of boxing, so as not to blunder on the chess board. Also, the sport gives rise to an interesting strategic feature, where a fighter with a losing position on the board would press for the KO on the canvas, and likewise, a fighter getting wobbly on the canvas would press for the checkmate on the board. The following video shows clips (starting at 7:25) of the middleweight championship match in Moscow, 2013, with champ Sven Rooch of Berlin defending against Jonatan Rodriguez-Vega of Spain. Just a few days ago, as I began breakfast, I noticed something new on my Wheaties box — a picture of Ultimate Fighting Champion Anthony Pettis. Wheaties boxes have long pictured top athletes, but this is the first appearance for the sport of mixed martial arts. So, while the Wheaties folks are adding sports, why not a chess champion on a Wheaties box? Or, maybe someday, a chessboxer? ← “Confidential Chess Lessons” Free to Anyone!